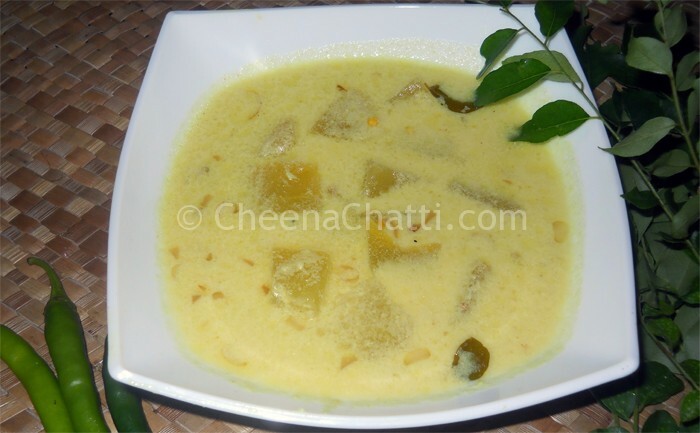 Kumbalanga (Ash guard / Winter melon) Moru curry is a very popular and traditional Kerala curry. Keralites love to have this curry along with white rice. In some places its also known as “Kaalan”. In an earthen / clay pot cook the ripe plantain / banana / ethakka in 2 cups of water along with Winter melon, green chilly and turmeric powder till the banana pieces become soft. Grind the coconut and Cumin seeds into a fine paste with 1/2 a cup of water. Add the paste into the cooked ingredients and stirr well. Cook for another five minutes in medium flame. Add blended curd and keep on stirring for 2 minutes. Make sure that it never boils. Switch off the flame and keep stirring the mix for another 1-2 minutes. The mix needs to be stirred for some time to make sure it does not separate outs. Add coconut oil to a frying pan and when it becomes hot add Mustard seeds. When the mustard seeds start crackling add the shallots and the curry leaves and saute it. Turn off the flame and pour it to the curry. Allow it to cool and serve it with rice. This can be stored for even two to three days. So you can prepare it and take it with you during a short trip. This entry was added on June 29th, 2013 by Cini P Moideen in Vegan and tagged with vegetarian, kumbalanga curry, kumbalanga moru curry coconut, kumbalanga recipes, umbalanga moru curry recipes, indian kumbalanga moru curry, winter melon recipes, kerala curry, kerala kumbalanga curry. Last revised on April 1st, 2018.